Khalen, 21, has begun archery, first as a hobby and has transitioned from a beginner to an intermediate archery standard in only 3 months through regular attendance at the Townsville PCYC archery club. He has also played wheelchair basketball for the last 8 years and was apart of the 2012 and 2013 winning side at the National Wheelchair Basketball Classics competition in Brisbane. 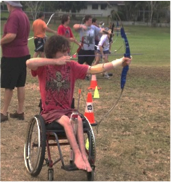 Khalen has begun archery, first as a hobby and has now dedicated himself to training, transitioning from a beginner to an intermediate archery standard in only 3 months through regular attendance at the Townsville PCYC archery club. Through the Cootharinga STARS school leavers program, Khalen was given the opportunity to attend archery classes, improving quickly, Khalen aims to attend the Paralympics. Khalen disability, Spina Bifida, has not limited his sporting goals, being a member of the Townsville Cyclones wheelchair basketball team for the last 8 years and was apart of the 2012 and 2013 winning side at the National Wheelchair Basketball Classics competition in Brisbane. Khalen is enthusiastic and serious about continuing with archery and working towards representing Australia. He is receiving a grant from Sporting Dreams to assist in reaching his goal. His advice to other other athletes would be to never give up on your goals no matter what happens.